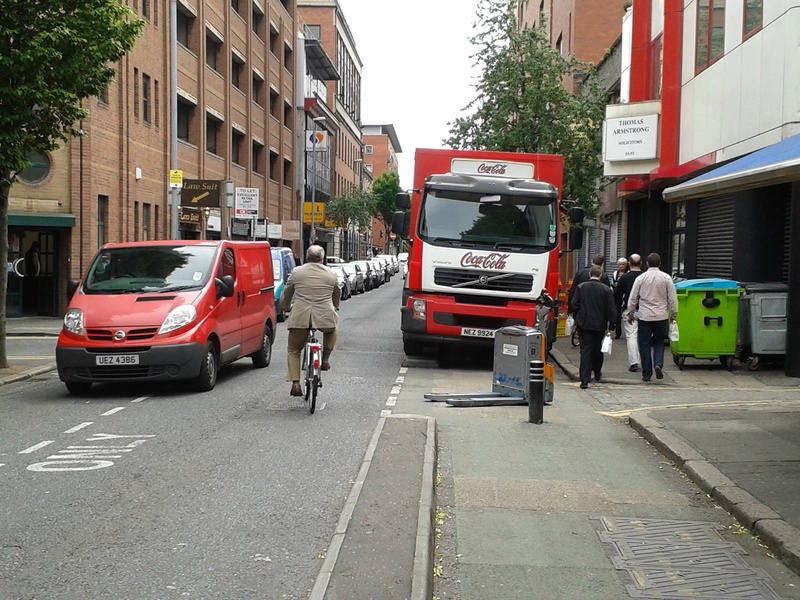 Coca-Cola HBC Ireland and Northern Ireland said yesterday that it will stop its contractors’ truck drivers from parking in cycle lanes and on cycle paths. The brand’s main company, Coca-Cola Ireland, is sponsoring the regional bicycle share system, due to launch in Cork, Limerick and Galway later this year. Coca-Cola issued the statement yesterday in response to questions from IrishCycle.com about repeated blocking of a two-way cycle path in Belfast city centre. The issue had been highlighted by NI Greenways on their website and twitter account. “At Coca-Cola, the safety of cyclists, as with all road users is important to us and we have investigated this matter fully,” a Coca-Cola spokesman said. The soft drinks company said that it currently employs a third party logistics firm to carry out all of its deliveries in Northern Ireland and have taken this issue up with the operations manager of the transport company. This is good news and it needs to be replicated by other large fleet operators under their CSR banners. Goods vehicles present the greatest risk of impact with cyclists so their drivers’ parking arrangements need to be exemplary. Cyclists should not be forced out of the putative protection of any cycling infrastructure by fly-parking. One category of truck operator that needs to be targeted is ‘document shredding’ vehicles who arrive early in the morning outside a premises and park in the cycle lane/track during its period of operation. But of course our Garda is ‘institutionally-blind’ to the real safety needs of cyclists and this is yet another reason why the government’s NCPF target of 10% of daily trips to be made by bike by 2020 will not be met. Domino’s Pizza on Kilmore Road Artane,Eircom sometimes on Cycleways like outside Fairview Pk together with Motorists and some Taxi’s nearly every day of the week now as well as Match Days in Croke Park and on weekends when they are all playing Football in Fairview Pk . Well done guys and well done Coca-Cola. Ha! Will believe it when I see it. Drivers have a chronic need to park in bicycle lanes or on footpaths whenever it is more convenient (i.e. brings them 1 foot closer to where they need to be) and no decision made in a board room far away will solve this. Good on you Cian! Hope that coporation can be effective in improving its sub-contractors’ drivers’ behaviour. Cheers. 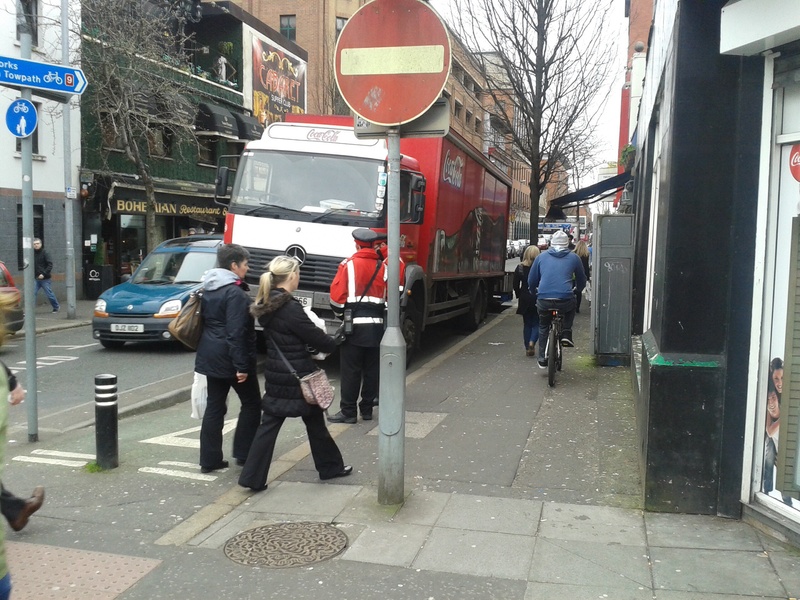 We should not forget the warped nature of (1) Irish road traffic law in that it permits unloading outside premises in cycling infrastructure for up to 30 min and (2) the discretionary way gardai apply such regs. As a goods vehicle operator you can more or less park as you please and no one will say boo! Sure haven’t we a great ‘culture’ of scant regulation!